We’d love your help. Let us know what’s wrong with this preview of The Children of Darkness by David Litwack. To ask other readers questions about The Children of Darkness, please sign up. My original The Children of Darkness audiobook review and many others can be found at Audiobook Reviewer. The Children of Darkness by David Litwack is the first novel in a series called Seekers. This story follows the story of a group of young adults as they begin to distrust the world around them and yearn to find a way to change all the negatives that they have become accustomed to. When their friend Thomas is taken from their small village of Little Pond to a Temple City to learn and fear the My original The Children of Darkness audiobook review and many others can be found at Audiobook Reviewer. The Children of Darkness by David Litwack is the first novel in a series called Seekers. This story follows the story of a group of young adults as they begin to distrust the world around them and yearn to find a way to change all the negatives that they have become accustomed to. When their friend Thomas is taken from their small village of Little Pond to a Temple City to learn and fear the darkness (a historical period of knowledge and violence), Orah and Nathanial are concerned for their friend. Thomas returns haunted. When Orah is taken next, Nathanial attempts to try to save her. During this ordeal, Nathanial learns of a quest to return knowledge to their dystopian and knowledge-fearing world. And so, the trio set out on a challenging path to find out if there is truth to the legend. Unwittingly, they are pursued relentlessly by the governing Temple. The Temple is set on stopping the return of knowledge to the land and will do anything to stop the three companions as they risk everything for a cause that they are not even sure they believe in. While this novel touched upon a lot of standard dystopian themes, it was unique in many ways. I enjoyed the quest aspect of the story and loved the contrast between the characters, their motives, and ultimately their loyalty to one another. The story is also told from multiple points of view, which allows insight into individual characters and makes these aspects of the story richer. Similarly, explanations and feelings regarding the period of the darkness and the idea of knowledge were thought provoking. The end of their quest revealed something that I thought was incredibly interesting and loved how it was handled. I did not love the characters themselves, unfortunately. Perhaps, they felt a little flat for the most part or I was not particularly inspired by their dialogue and thoughts. The ending was well done and I am intrigued by the fact that the story continues, as this novel could have been a stand-alone story. The narration by Erin deWard really did the story justice. Without her voicing, the story of have come off completely differently. It fit well with the characters and the environment. The production quality was good as well. I would recommend this novel to anyone who enjoys young adult dystopian novels filled with righteous quests. A little slow to start but interesting and intriguing non the less! I loved the idea of the plot. "A thousand years ago the Darkness came-a terrible time of violence, fear, and social collapse when technology ran rampant. But the vicars of the Temple of Light brought peace, ushering in an era of blessed simplicity. For ten centuries they have kept the madness at bay with "temple magic," and by eliminating forever the rush of progress that nearly caused the destruction of everything." In other wo A little slow to start but interesting and intriguing non the less! I loved the idea of the plot. "A thousand years ago the Darkness came-a terrible time of violence, fear, and social collapse when technology ran rampant. But the vicars of the Temple of Light brought peace, ushering in an era of blessed simplicity. For ten centuries they have kept the madness at bay with "temple magic," and by eliminating forever the rush of progress that nearly caused the destruction of everything." In other words, a devastating war happened. The Temple of Light was created where the Vicars kept everything secret and only thought people what they wanted to teach. The Vicars word was law and if you questioned anything, you were taken for a "teaching". Those taken were different when they were brought back! Creativity and Curiosity were not allowed and people lived a simple life. Nathaniel, Orah and Thomas have always been friends. All have questioned if the Vicars are right, though never in pubic! It's when Thomas is taken for a teaching that Nathaniel and Orah really begin to question things. Then Orah is taken and Nathaniel goes to save her. While there "they discover a terrible secret that launches the three on a journey to find the forbidden keep, placing their lives in jeopardy, for a truth from the past awaits that threatens the foundation of the Temple. If they reveal that truth, they might once again release the potential of their people. ~ Yet they would also incur the Temple's wrath as it is written: "If there comes among you a prophet saying, 'Let us return to the darkness,' you shall stone him, because he has sought to thrust you away from the Light." I'm not saying anything else about the plot because I don't want to ruin it, so all I'll say is that it's unique and interesting! The characters were all fleshed out and well written. I liked Orah and Nathaniel but thought Thomas needed to be more adventurous. At times he came across as an after thought and wasn't really compelling. I have to admit, I was a bit hesitant about reading this book. I’m not usually a sci-fi fan, but something about it was calling out to me, plus I’ve found a bunch of surprisingly good books from the Juniper Grove Book Solutions library, and I just couldn’t pass this one up while it was available. I’m so glad I went with my hunch because this book was amazing! It sucked me in right from the beginning, and I had a really hard time figuring out why it was even sci-fi in the first place. There are n I have to admit, I was a bit hesitant about reading this book. I’m not usually a sci-fi fan, but something about it was calling out to me, plus I’ve found a bunch of surprisingly good books from the Juniper Grove Book Solutions library, and I just couldn’t pass this one up while it was available. I’m so glad I went with my hunch because this book was amazing! It sucked me in right from the beginning, and I had a really hard time figuring out why it was even sci-fi in the first place. There are no aliens. No time travel. But I feel like even telling how it is sci-fi is kind of a spoiler, so I guess you will just have to read and find out the way that I did. It was pretty awesome. But yeah, no aliens, time travel, or robots. Haha. Which is good, because I’m not into any of those things. The three main characters are portrayed so awesomely, and I love how the story doesn’t focus on just one, but it manages to encompass all three of them in just the right proportions. Not one of them is dominant, and they all play a vital role in the progression of the story. I reviewed this book from the author in exchange for a honest review. I enjoyed this story. It did start off a little slow but I found myself hooked to their journey. After I finished even though it started slow it made perfect sense. It was actually set up perfect for the tasks they had to endure. It is a great dystopia in a backwards world. I am eager to see what comes next. It made me think about giving one group too much power. It also teaches you to ask questions. I plan on reading the rest I reviewed this book from the author in exchange for a honest review. I won this book in a Goodreads Giveaway that was hosted by the author. I was pretty excited upon receiving the email I had won it. I am a avid reader of all Dystopia books and this sounded great. The Children of Darkness, by David Litwack , wasn't the typical Dystopia I prefer to read. My excitement to read this book quickly wavered once I reached the third/fourth chapter. It started off slow, slower than what I normally consider tolerable for the start of a book. Thoughts on the story and charac I won this book in a Goodreads Giveaway that was hosted by the author. I was pretty excited upon receiving the email I had won it. I am a avid reader of all Dystopia books and this sounded great. Thoughts on the story and characters. Nathaniel, Orah and Thomas were nice characters, but, at times they annoyed me. I think it had a lot to do with how the author created the structure of how they communicated with one another. Orah to Nathaniel " Nathaniel of Little Pond, I think this may work"
The vicors to Orah " Orah of Little Pond who's name means Light"
They spoke like this through out the book and it highly annoyed me. The book is set in the future in a modest community where there is no cars or electronics in the world, I felt the way the backdrop of the town and the attire of how the characters where described to dress felt medieval. I feel the author would of been better not making it a dystopia and setting it back in a medieval time instead. I'm not going to lie, I did struggle reading this due to these minor factors. I would of much rather it as a adventure novel. There were times when I really enjoyed this book and would start to think okay this is going to get really good, something major is about to happen, but nothing too drastic ever happen and....That disappointed me. The author would build and build a scene up and then BAMB nothing too exciting ended up happening. There was also a lot of wondering through the woods that also annoyed me. The conversation between the characters wasn't enough to carry the story either. They did have a nice friendship but nothing rememberable. I did want to like this book. BELIEVE ME I DID! But there was so many times I was let down with it. I gave the book 3/5 simply because the story line was good but it lacked in other areas. A wonderful book about how the people are brought out of the temple of light to a new beginning of the civilization of seeking the truth about life. I received a free digital copy of this book in exchange for an honest opinion. To begin with, it took me a while to get into the book. It usually doesn’t take me that much time to accept a new world and its characters so I can say that I struggled a bit with this one, mainly because our main characters: Orah, Nathanial and Thomas spoke in a too perfect English which for some reason gave me the Shakespearean feels. Trust me, I enjoy reading a well-written book but not when it comes to formal conve I received a free digital copy of this book in exchange for an honest opinion. To begin with, it took me a while to get into the book. It usually doesn’t take me that much time to accept a new world and its characters so I can say that I struggled a bit with this one, mainly because our main characters: Orah, Nathanial and Thomas spoke in a too perfect English which for some reason gave me the Shakespearean feels. Trust me, I enjoy reading a well-written book but not when it comes to formal conversations between what we call teenagers nowadays. However, I accepted it at some point by keeping in mind that these characters live in a complete different era and that the casual English has been left behind thousands of years ago when the Darkness fell upon the world. The whole idea of this book intrigued me and made me continue reading, I enjoyed following their journey of finding the truth and liked how each character matured by the end of the book. Let’s start off with Thomas, my favourite character. Thomas is the sort of character who’s not interested in taking anything seriously, he’s more interested in anything that’s edible, so imprison him in a kitchen and he’ll be just fine. He’s so full of life and he’s just the sort of person you’d always want to be around. When the Temple of Light takes him for a teaching, we’re introduced to a frightened and weak Thomas, however he surprises us with his bravery and courage later on. As for Nathanial, two words are enough to describe his personality, the dreamer. Without him, there would be no journey of finding the truth in the first place. Orah is the feisty and don’t-you-dare-stop-me character, (what is it with red-haired people, seriously.) Let’s just say she’s got a bit of Hermione in her. And while all the characters played an important role, I still believe that she’s the one whose presence made a big difference. I also liked how the author gave each of the characters a chance to shine. If there’s anything that I wasn’t satisfied with, it was the lack of action. I was expecting a real battle by the end of the book and that just didn’t happen. I honestly didn’t like how everything happened so easily without a struggle, yes I know the characters already struggled enough when it came to making sense of the rhyme and finding the truth but that still doesn’t mean to make it an easy ending. I WANTED SOME ACTION FOR LIGHT’S SAKE. See what I did there. Ahm, excuse me. I hope that happens in the second book, I’m not asking for bloodshed, I just want a strong confrontation between them and the people of Temple of Light. Overall, the ending had a good part but also a disappointing part to it, I’ll leave it at that and you’ll know what I mean when you read the book! The author’s done an exceptional job of making the characters so relatable (aside from their too perfect English) by proving that a person’s decisions can’t always be right and that mistakes are bound to happen. I appreciate the message he delivered, that it doesn’t matter if you’re just a teenager in the eyes of others, doesn’t matter that you’re just someone from a small village in this massive world, because you can make a difference in this world, you can stand up and not be afraid to tell the world what you personally believe and think, you can make an end to what is wrong, you can make your dreams come true, if only you believe in them. And in yourself. A few lines which I couldn't help but highlight! He stood out of view, blocked by the boulder, so she shouted across to him, "If you fall, Nathanial, you better die, because if not, I'm coming down to kill you." I'm what they fear most: the truth. So here will I stay forever. What good are dreams if they stay unfulfilled? I got this book as an ARC in exchange of an honest review. I totally loved this book. After reading so many dsytopian books, I was not really looking forward to yet another dsytopian future book and I constantly kept comparing The Children Of Darkness with books like The Giver and Divergent series and to an extent, this book was quite similar to those books, but it had its own distinct uniqueness. The book started off as all dsytopian books do, explaining the rules that the world follows and how I got this book as an ARC in exchange of an honest review. The book started off as all dsytopian books do, explaining the rules that the world follows and how people are chosen by the Temple of Light, ruling power of the world, for teaching. Teachings were simply a display of the horrors of our world, i.e. of the past. All the good things on this time were hidden from them. This story tells us about the journey of Nathaniel, Orah and Thomas of Little Pond, who become the seekers of truth, traveling all over the place in search of the keep. The Keep is something that can overthrow the power of Temple and enlighten all the people with the truth. The book is divided into 4 parts and hence I felt it was a bit long. But the book is written in such a great way that I couldn't keep it down once I started reading it! I would have preferred the main treasure hunt part to have been more elaborate and a bit difficult for 3 people who are said to have been of age. They seemed to be getting their work done a bit too easily at times. The world Litwick creates is rich and believable and he m In this deceptively simple adventure/quest story, David Litwick manages to create a rich theocracy, its opposition and raises many valuable philosophical questions. I am a fan of James Dashner's post apocalyptic novels, presenting dystopian civilizations ruled by cruel tyrants, and this book, written with several similar themes, was one I truly enjoyed. Still, while there are some themes similar between this book and the aforementioned books by Mr. Dashner, David Litwack has a style that is all his own, and has created a wonderful, albeit frightening image of a future world ruled by a dictator I received a copy of this book in exchange for an honest review. Still, while there are some themes similar between this book and the aforementioned books by Mr. Dashner, David Litwack has a style that is all his own, and has created a wonderful, albeit frightening image of a future world ruled by a dictatorial theocracy. This theocracy, whose headquarters are ironically called the Temple of Light, seeks to control individual thought, and control the actions of its people. One of these control tactics, called a "Teaching" is one of the most truly terrifying ways the Vicars and Deacons (who are nothing like I know of modern vicars and deacons) use to control the people. They claim to teach "light" and shun the "darkness" but what they really do is just the opposite. And this controlling theocracy might well have continued, but for three brave friends who set out to find the real truth for themselves. I noticed a few small conventional errors here and there, but nothing that interrupted the flow of the story for me, or to lower the rating. If you are a fan of post apocolyptic dystopian like I am, you will enjoy David Litwack's The Children of Darkness. And the best part, is that it's only the first book! Disclosure: The e-book version of this novel was sent to me for an honest review. The opinions are entirely my own. “The Children of Darkness” is the first book in the YA series “The Seekers” and it’s a lovely book. My only complaint is that… it’s closer to a middle-grade level rather than YA. I loved the idea behind the story. What if we returned to the Dark Ages? There is an interesting commentary on religion and individual thinking. But at the same time I found the story too… easy. All the tro Disclosure: The e-book version of this novel was sent to me for an honest review. The opinions are entirely my own. But at the same time I found the story too… easy. All the troubles the heroes encounters were so easily resolved and there was not one single moment in the book when I was worried that they might fail, and although most books get the happy ending in the end I still want to feel for them and root for them. The main characters in this book have it really easy! I will probably check the next book in the series (I think it comes out this November) – although this one works great as a stand-alone book too. I hope to connect more with the characters and for their obstacles to become real obstacles. Three young villagers come of age in a world kept peaceful by an oppressive theocracy called the Temple of Light. Their lives change when Thomas and Orah are sent for the temple's mind control ritual, the teaching. Nathaniel tries and fails to help them and in the process is imprisoned. In the dungeons of Temple City, he discovers a secret that shatters his view of their world. This starts them off on a path of discovery, where they learn the truth, not only about their world, but about themselves and each other. The plot has twists and turns that keep the reader spell bound. The characters are richly drawn and the society vividly exposed. As the three friends grow through their many adventures, the author explores how an individual finds the courage to confront authority and change the world, all without the gratuitous violence of books like The Hunger Games! Great read. I received this book in exchange for a honest review. It is a post apocalyptic novel, presenting a dystopian civilization ruled by a cruel tyrannical clergy. Orah, Thomas and Nathaniel are three friends since childhood who stick together through great odds to challenge the Temple of Light. The book was a very enjoyable read and well written. My first thoughts? Absolutely amazing! In this well-written Dystopian read, the author has created a unique post-apocalyptic world that kept me interested the entire length of the novel. The plot is perfectly timed with enough anticipation (Will the teenage friends make it the keep? What will they learn while there? How will this apply to their lives? Will the vicars catch them?) enough calming moments that the reader can just simply enjoy. The three central characters, Orah, Nathaniel, and Thoma My first thoughts? Absolutely amazing! In this well-written Dystopian read, the author has created a unique post-apocalyptic world that kept me interested the entire length of the novel. The plot is perfectly timed with enough anticipation (Will the teenage friends make it the keep? What will they learn while there? How will this apply to their lives? Will the vicars catch them?) enough calming moments that the reader can just simply enjoy. The three central characters, Orah, Nathaniel, and Thomas, are all likable in their own way. Though each are portrayed with a distinct personality, the three mesh well together and have realistic traits that many can find at least one relatable. To be honest, Orah reminded me a Hermione Granger with her wit, smarts, and resourcefulness. For me, having a character similar traits to one of my all-time favorite female leads is a plus! There is a religion aspect played throughout the book. After all, the vicars are the ones in charge and encourage everyone to pray to light and do not fall into the darkness. Praying and worshiping the light is something taught at a very young age, and no one is supposed to question it. When the three friends reveal the truth, let’s just say, they cause a bit of a ruckus between the balance of religion and the structure of the societies built in this world. Overall, I loved every minute of this read and cannot wait to read the next one! I highly recommend this read to those who enjoy Dystopian reads with a strong friendship immersed in the story! This was intriguing dystopian coming of age saga of three friends. They live in a world of black and white - and no dreams, no free thinking. I enjoy this story, the journey, the discovery, the beginning of a rebellion. If you enjoy YA Dystopian adventures - you might want to give this one a try. Was this olden times of the past or could this actually be our future? Because of our inability to get along and care for each other and the mad desire for power over each other, could easily cause this to be our future. Superb fantasy story by a first time author for me. I just loved it and am definitely ready for more. A post apocalyptic story where the recovery of the world has been engineered and is managed by a religious group who very much like to maintain a status quo. Three young people seek to find out the truth of the past and maybe the possibilities of the future. Pretty good, but one installment was enough for me because it is very much a young adult story. Like all of the best dystopian future novels, this story was deliberately vague about the ‘when’ and ‘where’ so that it would remain timeless. What we do know is that it is set hundreds of years from the present day, in a second dark age centuries old. The premise of this novel was excellent and highly poignant in this day and age. The world is undergoing a second dark age, spanning centuries, where all progress, discovery and freedom of thought is halted by a religious order known as ‘The Temple’. This order isn’t inherently evil, it has been created by agreement following devastating destruction caused by religious wars in the past – this order is the amalgamation of different religions, keeping only the best and fundamental facets. The order has now become corrupt and is ‘teaching’ young adults in the population, to ensure that civilians are obedient and reject ‘the darkness’ which is essentially anything which can be considered to call the Temple into question. This teaching involves non-violently torturing one in three young people and traumatising them into obedience, which has led to what approaches a majority of the population despising and resenting the regime. The story follows three characters who have certain fleeting similarities to the main characters of the "Harry Potter" series; all three have very strong and unique personalities but they are bound by loyalty, friendship and bravery. I love to see this in young adult books, characters who compromise and sacrifice their own safety for friendships rather than for romantic ties. Thomas is a happy-go-lucky boy who is chosen by the Temple to undergo a ‘teaching’, despite the psychological damage he suffers from this, he returns to his friends and will do anything to help them despite his fears. He can’t feel the same resolve as the other two to overthrow the Temple because he can understand why the organisation exists, having been shown the atrocities associated with ‘the darkness’ that the Temple protects the population from, however his loyalty is with his friends. Nathan is an imaginative and brave character, he doesn’t question that he is destined for better things than he can hope to achieve back home. When he finds himself in a position to escape the Temple and ultimately save both of his best friends, he doesn’t question it and jumps in head first – this is perfectly balanced by Orah, the wiser and more steadfast of the three who keeps them on track and safe. She isn’t afraid to back down from a fight, but is the most likely to think their way out of needing to fight in the first place. This story is excellently paced, the three friends begin a journey to collect four clues which will lead them to the keep, a mysterious location which will contain the knowledge to bring down the Temple. Each clue allows us to learn more about this interesting world and the history of new characters to form our own opinion about the Temple, the author has clearly planned this out very carefully so that none of the story is rushed or filled with information dumps. Once the characters arrive at the keep, the tone of the book then changes from the adventure and chase sequences we have encountered so far and becomes more introspective, as each character now faces the moral dilemma of what they should do with the new information they have uncovered. I really enjoyed this book, the author has a wonderful use of language and doesn’t bombard us with unnecessary information regarding the world or the characters, we are allowed to work certain things out for ourselves but all the important details are provided. The relationship between the main characters was particularly inspiring, that they remained loyal to each other despite everything they went through and their separation. I would highly recommend this to young adults with a passion for reading, but also older adults who enjoy dystopian future novels – this contains some very interesting ideas regarding the resolution of religious wars in society and what would happen in the aftermath. I admit it: I liked this book more than I thought I would for a good while. It's a dystopian book, but that takes a while to come out, and it begins like a humdrum fantasy, which put me off a bit at the beginning. The story starts with a festival in the town of Little Pond, and one of a handful of annual visits by a vicar from Temple City to bestow a blessing of light, deal out medicines, and--unfortunately--take away one of the main cha More reviews available at my blog, Beauty and the Bookworm. I admit it: I liked this book more than I thought I would for a good while. It's a dystopian book, but that takes a while to come out, and it begins like a humdrum fantasy, which put me off a bit at the beginning. The story starts with a festival in the town of Little Pond, and one of a handful of annual visits by a vicar from Temple City to bestow a blessing of light, deal out medicines, and--unfortunately--take away one of the main characters, Thomas, for a "teaching." Thomas leaves behind his friends Orah, who has prophetic dreams, and Nathaniel, who believes he is destined for greatness. In Temple City, Thomas receives his teaching, showing the horrors of the past age called "the darkness," a time when people used weapons like suns they dropped from the sky against each other. He comes back changed, and shortly after Orah is taken for a teaching of her own--but Nathaniel, determined not to let another of his friends suffer, goes after her, and he, Orah, and Thomas end up on a quest to discover the truth about the darkness and whether the vicars of Temple City have been lying to them their entire lives. Not-so-spoiler: they have. This is pretty much a given in a dystopian book. What makes this interesting in comparison to most modern dystopians, I feel, is that the government in control of the land is a theocracy. In most dystopians published these days, religion has been eliminated or at least pushed to the fringes. In The Children of Darkness, religion--granted, a conglomeration religion and not one of the ones that's currently practiced on Earth--is front and center. I liked this, because it shows how government and religion can be so strongly linked that they can become the same thing, even in places where one isn't actually portrayed as the other. It also makes it harder for the heroes to invoke change, because they're fighting against a doubly-strong force; trying to turn people away from a political structure of life and a religious one is, in theory, twice as hard as trying to turn people from just one of them. That said, this book can be a bit slow. The quest of looking for the truth about the darkness doesn't progress very quickly; there's not a lot of action. You're not going to find any girls on fire in this book, no teenagers quite literally fighting the power. There's a lot of walking from place to place, admiring of the scenery and creations left over from the previous age, and then a lot of sitting around and learning. This was necessary for the characters, because the main thing they're trying to do is find out the truth; they're not dead-set on overthrowing the system, they just want to know what's really going on. When they do decide to act, they do it with words rather than weapons. I'm skeptical of how successful this would have realistically been, since they never actually emerge into the light and kind of end up with a leaderless movement, but eh. Whatever. However, this non-action might mean that this isn't the book for people looking for something a little more like The Hunger Games. It's a slower, lower dystopian, and it also kind of ends up feeling more like backstory for whatever comes next. There are supposedly two more books in this trilogy, one of which is currently out. I think I'll read the next one, at least--it involves crossing the ocean, which is a much more intriguing proposition to me than finding the keep was--but I'm also interested in reading another Litwack book I already happen to have, Daughter of the Sea and Sky. I think his writing and world-building skills are strong enough to give another look, even if this one wasn't quite as fast and action-y as I would have thought, and might have liked. Imagine a world where you weren’t allowed to think for yourself, at all. Where any individual thought would be considered darkness and could endanger you and those around you. This is the world in which Orah, Nathaniel and Thomas live in. In their small village of Little Pond, they each serve their own purpose to help their families and community. Little changes in their daily schedule, but yet the three friends find themselves a safe haven to discuss their ideas/beliefs in private. As the coming of age ceremony approaches, young Orah has an uneasy feeling. Though it’s true the vicar only take one of three, both of her best friends have come of age and she fears one of them will be chosen. Thus begins a journey that will take the three friends to the very end of their world and beyond. One in which they will be forced to put their beliefs in ideas that make little to no sense to them. A journey that is meant to save their world from the clutches of the Temple of the Light and return some version of free thinking to those in their world. When I initially began reading this book, I found myself spotting details that were similar to other tales of dystopian worlds. But these moments were fleeting at best and I found myself loving the world the author built. It’s hard to describe the aspects I loved most, because I fear I will spoil the book and I really don’t want that. But what I can say is, things are not what they seem. As the three friends begin their journey, you see their world and their ideas through their eyes. However, what they don’t know initially is they have been misled their entire lives. It’s not until Nathaniel is set up to be imprisoned next to an old man that the vicars have held for over twenty years, that they begin to truly question the lives they are being forced to live. Their mission seems simple at first, but what they begin to realize is it’s anything but. The secret they are looking to uncover has been hidden for nearly a thousand years and if one part of the chain has been broken in that time, all will be lost forever. With no idea what they may uncover, the three still bravely take on the task of being a seeker, in order to discover the truth about both the light and the darkness. In time, they discover the line between the two isn’t as defined as they believed and though many things have been lost to them, there still may be time for them to save the future. This a phenomenal book that is both thought provoking and full of adventure. So while I cannot explain a lot of what I liked about this book without ruining it for you, I hope you’ll be willing to check it out for yourself. The pacing of the story is fast and the author has a great concept of how and when to elaborate on the adventure and when to withhold the specifics in order to keep the story moving. By the end of the book, I found myself almost wishing he had spread things out into several books. Not because it didn’t work the way it’s written, but because I didn’t want the story to end. I don’t know what else to say without spoiling a major part of the story. What I can tell you is this: this is a fantastic book and was a fun and easy read. Though I’m not sure where the series could go from here, I look forward to finding out when book two is released. I hope you will take the chance and pick up your copy today! * I received a copy of this book through the Goodreads First Reads program. This Dystopian fiction novel will captivate both Young Adult and Adult readers alike. David Litwack uses the story to examine how a theocracy works and how, over time, knowledge can be lost. He also examines the question of whether it is better to have free thought or whether safety and security is worth the loss of personal freedoms. This book will stay with the reader long after reading the final page. This is the first book in "The Seekers" series. The second book, "The Stuff of Stars" is due for release in November 2015. I hate that I have to wait a few more months to read it, but I am glad it is set to be released soon. This is a dystopian fiction epic set a thousand years in the future. Society is completely devoid of technology. Even simple things like maps have been banned and few people even know what the term means. The populace has returned to a simpler way of life. They refer to the time before as "The Darkness." Everyone lives by the rules of "The Temple of Light." The belief is that the Vicars and The Temple keep the Darkness from returning by using "temple magic." What is the truth? Well, you'll need to read THE CHILDREN OF DARKNESS to find out. Orah, Nathaniel and Thomas have all been friends since childhood. All three live in the tiny community of Little Pond. When Orah is sent to Temple City to receive a "teaching", Nathaniel decides to follow her and to attempt to save her from the horrors inflicted on those who receive "teachings." Placed in a prison cell while awaiting the Vicar's decision as to what fate will befall both Orah and Nathaniel, a secret is revealed to Nathaniel. A secret so explosive that it has the potential to change the world forevermore. Author David Litwack has created a world that is not only amazingly vivid, but is also written with stunning detail. He has created an entirely new religion and has shown through his fiction that human beings possess the capacity for both great good and great evil. The long ago past of this story sounds alarmingly like the reality of our current reality. He writes about wars being fought and atrocities committed in the name of religion. This brings to mind the current situation in the Middle East. There are many other similarities to modern times, but I will leave it to future readers to discover exactly what these are for themselves. THE CHILDREN OF DARKNESS may be a fictional tale, but it is also clearly a warning. It does not preach to the reader, in fact it allows the reader to experience each discovery at the same time as Orah, Nathaniel and Thomas. "The Children of Darkness" is the first book in "The Seekers" series as I mentioned earlier in this review. This book could have been spread out to become two separate parts of the series, but I liked the fact that the author chose to include so much of the series into a single volume. This book is allowed to come to a proper stopping place. It still leaves the reader wanting to read the next book right away, but the reader does not feel like the story ends abruptly. I rate this book as 5 out of 5 stars and am very much looking forward to reading Book Two in "The Seekers" series. "... ideas combined with courage can change the world." "Which is the greater illusion - a life of contentment and peace, or the dream of a better world?" The Children of Darkness, the first volume of David Litwack’s The Seekers series, is a classic quest story. Three young heroes embark upon a journey to uncover a secret that can save the world. Along the way they meet a wise guide and encounter daunting obstacles that test their courage and resolve. And they return very changed. This YA novel follows the pattern, but it’s anything but run of the mill. The quality of its intelligence, imagination, and prose raises The Children of Darkness to the l The Children of Darkness, the first volume of David Litwack’s The Seekers series, is a classic quest story. Three young heroes embark upon a journey to uncover a secret that can save the world. Along the way they meet a wise guide and encounter daunting obstacles that test their courage and resolve. And they return very changed. This YA novel follows the pattern, but it’s anything but run of the mill. The quality of its intelligence, imagination, and prose raises The Children of Darkness to the level of literature. Orah, Nathaniel, and Thomas live in a theocracy. The Temple of Light came into existence a after a series of wars almost destroyed humankind, and for a millennium it has kept the peace. The Temple controls every aspect of peoples’ lives. The vicars of the Temple prescribe how many children a family may have, how people cook their food, what musical instruments they play, and, of course, what they’re allowed to think. The rules are enforced by bands of deacons and by “teaching” the young in a process that amounts to torture. A vicar comes to the village of Little Pond and selects Thomas for a teaching. When he returns, he avoids Nathaniel and Orah because the vicars have forced him to betray his childhood friends. Next Orah is taken for teaching. Nathaniel follows her and the vicar to Temple City and offers to take her place. While he awaits the vicars’ decision in a dungeon, the old man in the adjacent cell tells him of the Keepers, a secret group who through the centuries have passed down coded directions to the Keep, a hidden place where the wonders of the ancient world are preserved. Everything forbidden by the Temple is there. The old man appoints Nathaniel a Seeker, charged with finding the Keep, and gives him the first part of the code along with clues to the location and identity of the next Keeper. After Nathaniel returns to Little Pond, he and his friends set out to find the Keep. At first their quest appears altogether noble and right. The Temple of Light is oppressive, cruel, and anti-intellectual. As the wise man explains to them, the aim of teaching is to extinguish the fire in human beings — the spirit that drives individuals to dream and achieve and aspire to greatness. Teaching almost destroys Thomas. But a thousand years ago, humankind almost destroyed itself and the world with the magic in the Keep. For all its shortcomings, the Temple makes it possible for human beings to live in harmony among themselves and with nature. The quest might open Pandora’s Box. Litwack avoids the usual tropes of YA fantasy. There’s no simpleminded battle between good and evil, no sexual jealousy and tension between friends, and no adolescent bickering. The friends argue about things that matter — how they can best survive, whether the quest is worth the cost. In The Children of Darkness Litwack has created a fully realized and altogether believable world. The characters, including the functionaries of the Temple, are complex and sympathetic. The conclusion is unexpected yet feels altogether right. Everything is set for the next volume of the series, which I very much look forward to reading. I actually finished this book a few days ago. I decided to wait a few days before reviewing because I had mixed feelings about the book. This is one of those occasions when I wish that Goodreads had half-star ratings. (Would give it a 2.5 rating) While I liked this book, overall I felt that it lacked something. I couldn't put my finger on it, but having sat on it for a few days, I think I can express what it was. "The Children of Darkness" is a dystopian novel of a country that rebelled against th I actually finished this book a few days ago. I decided to wait a few days before reviewing because I had mixed feelings about the book. "The Children of Darkness" is a dystopian novel of a country that rebelled against the darkness caused by technology and regressed back to a society with little if any modern conveniences and where the economy seemed to run on a barter system. The ruling government cares for it's people by providing a strict set of laws to live by according to "The Light." When compliance is met, each community is given medicine to help them overcome illness and disease. Anyone caught with "radical" ideas was taken for a "teaching" where they learn the evils of the old society and how darkness came to rule. (a bit hunger-gamish but without the violence) The overall outcome of these teachings was fear - instilled so deeply that the person who was "taught" is never again quite the same. The three main characters, Orah, Nathaniel, and Thomas, go against the ruling vicars and on an adventure to discover secrets of the past society. I have to commend Litwack on the construction of the new society. He did a good job of creating a believable world that has essentially gone backwards 150 years from what we know today. His characters were well defined, with hopes and aspirations that not only make them strong, but played into their weaknesses as well. There is a bit of a love story between Orah and Nathaniel. And Thomas makes for a very complex character being the only one of the three who has experienced a "teaching." The writing was good. Litwack has an easy, descriptive style which worked well. What didn't work for me in this story was that what started out as a YA novel within a few chapters started to feel like middle-grade. I don't know if the author was trying to keep the content clean or if perhaps it really was meant to be middle-grade. But after a sprinkling of something "dark," the rest of the content hinted at danger, adventure, and trouble, but never quite delivered. It was as if all emotion was tempered to the point of non-existence. I kept waiting for something to happen and it never did. The one moment when I thought, "Finally...we're going to get some real drama!" actually deteriorated into another non-event when the corrupt government official went soft on the protagonists. What could have been high drama felt more like a newspaper reporting than a suspense novel. Will I go on to read the rest of the series? Probably not. Litwack failed to engage me enough with the characters to make me want to invest in another novel. Just a so-so read, but a good one to introduce middle-grade readers to the dystopian market. 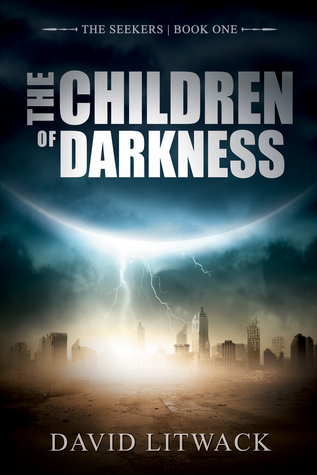 The Children of Darkness is an original twist on the post-apocalyptic genre. Three youth are coming of age and instead of conforming to the current trends of the religious/political leaders they are thrust into an adventure that helps them grow into heroes and through their courage they help transform the way people think and the way politics function. What I think I like most about this book is that the teenagers are relatively normal. They don't face up to grown adults and beat them in hand-to- The Children of Darkness is an original twist on the post-apocalyptic genre. Three youth are coming of age and instead of conforming to the current trends of the religious/political leaders they are thrust into an adventure that helps them grow into heroes and through their courage they help transform the way people think and the way politics function. What I think I like most about this book is that the teenagers are relatively normal. They don't face up to grown adults and beat them in hand-to-hand combat as is often the case with YA books. Instead they use their wits to solve puzzles and help make change. I liked this book and kept turning pages to see what would happen, but I also often found myself thinking the book was a little rushed, and tons of stuff happened. I think if the author took time to develop characters more and show the action instead of narrating it, this story could have been two very well rounded books. Now with the political situation basically resolved, I think a sequel will seem forced, or at least like it is an afterthought. Having said that I do like self-contained stories so in a way I'm glad I got good resolution. So the one-book-or-two-book thing doesn't really matter because the story was page-turning and fun. 1. I felt there was very little intensity. Because of the rushed pace and narrated feel to the book, things that could have been intense were simply told in story form. Some scenes I would have loved to see played out were just not there. 2. The main characters didn't really need to struggle. When they needed food, it was given to them; when they needed shelter, they found it; when they tried to solve a thousand year old problem, the solutions came easily. They always seemed to solve the problems very quickly without any resistance, the whole time they were making some pretty big mistakes. I would have like to see them struggle and grow a little more. 3. The foundation of the heroes' success is that there are some things that were lost over time, and just by reading a couple of postings of information people rose up in a peaceful rebellion against the government. What was on those pages? We are never told. If you develop a world and create a fallen political system, please give the details that will make all of this come together. I'm really confused why the writing on those pages was missing from the book. For these reasons I had to give this good book a 3 star rating. I also want to emphasize that, despite its flaws, I did enjoy reading this book. It was fun, fast paced and had a solid ending. I'd recommend it for those looking for a quick clean original YA book. Orah Weber (daughter, weaver) lived in Little Pond (village). Susannah Weber (mother) resided there also, Orah’s 2 best friends were Nathaniel Rush (farmer), & Thomas Bradford (flutist). William (Orah’s father) had been killed). Risking his life Nathaniel journey’s to Temple City to see Orah who had been brought there for the teaching. She was locked away in a cell. Samuel (old prisoner) told Nathaniel & Orah that the Grand Vicar & the rulers before them wanted to eradicate everyones pas Orah Weber (daughter, weaver) lived in Little Pond (village). Susannah Weber (mother) resided there also, Orah’s 2 best friends were Nathaniel Rush (farmer), & Thomas Bradford (flutist). Samuel (old prisoner) told Nathaniel & Orah that the Grand Vicar & the rulers before them wanted to eradicate everyones past. The keepers held all the secrets to the past. Who were the keekers it was such a puzzle no one really knew. Generations of the keepers had died to preserve the secrets. Poems or prose (rhyme) are also used so that each indvidal who had been through the teachings had to figure out who the keeper is. Nathaniel & Orah were off to Adamsville (city). Thomas had now joined them on their journey. A Shopkeeper (keeper) presented Nathaniel, Thomas & Orah with a scroll that had another rhyme on it. After 2 weeks the 3 of them known as the Children of Darkness (seekers) finally arrived at Bradford. The gray friars (wizards of temple magic) serve the clergy in secret. As the vicar of Bradford I study the book of light, & the gray friars ponder the knowledge of the past so they can better help the Sun icon. They met Lizbeth (master shoemaker), her father had passed away. She had given them the final scroll that contained all the pieces to the puzzle. Where is the Temple of Truth located? The Arch Vicar of the Temple of Light has givien Orah & Nathaniel some future information. A very awesome book cover, great font & writing style. A failry well written dystonian book. It wasn’t always very easy for me to read/follow from start/finish, but never a dull moment. There were no grammar/typo errors, nor any repetitive or out of line sequence sentences. Lots of exciting scenarios, with several twists/turns & a great set of unique characters to keep track of. This could also make another great movie, animated cartoon, or a mini TV series. To be continued. Not sure I got the whole story content so I will rate it at 4/5 stars. The urge to write first struck at age sixteen when working on a newsletter at a youth encampment in the woods of northern Maine. It may have been the wild night when lightning flashed at sunset followed by the northern lights rippling after dark. Or maybe it was the newsletter’s editor, a girl with eyes the color of the ocean. But he was inspired to write about the blurry line between reality and The urge to write first struck at age sixteen when working on a newsletter at a youth encampment in the woods of northern Maine. It may have been the wild night when lightning flashed at sunset followed by the northern lights rippling after dark. Or maybe it was the newsletter’s editor, a girl with eyes the color of the ocean. But he was inspired to write about the blurry line between reality and the fantastic. Using two fingers and lots of white-out, he religiously typed five pages a day throughout college and well into his twenties. Then life intervened. He paused to raise two sons and pursue a career, in the process — and without prior plan — becoming a well-known entrepreneur in the software industry, founding several successful companies. When he found time again to daydream, the urge to write returned. In this new stage of his life, he’s published Along the Watchtower in June, 2013 and The Daughter of the Sea and the Sky in May, 2014. His latest book, The Children of Darkness, the first of the Seekers series, a dystopian trilogy, was published in June, 2015.